Answer: All those extra lights cause less difficulty for professional astronomers, who prefer to sequester themselves in observatories on high mountaintops miles from large populated areas. You won’t find any holiday lights hanging around observatories. But they still notice the difference in sky glow from nearby cities. For us amateur astronomers, it’s more of a problem since we generally observe from our own back yards, or sites not too far from home. It’s bad enough that some people leave their outside “security” lights on all night. Adding all that extra holiday wattage makes the star gazing even worse. The DOE has estimated that decorative lighting consumes three billion kilowatt-hours of electricity over the 30-day holiday period. At the national average rate of 8.4¢ per kilowatt-hour (do the arithmetic) that’s a lot of money — and perhaps more importantly, a huge amount of energy. Don’t get me wrong. I’m not suggesting, Scrooge-like, that we do away with holiday lighting. Rather, consider switching from the older large C-7 bulbs to the new mini-lights or, better yet, the newest LED lights. 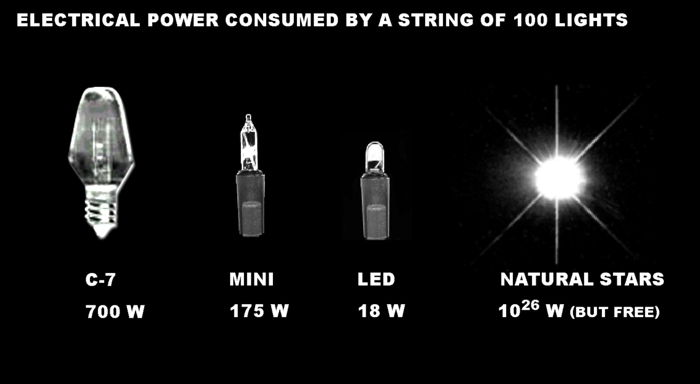 The LEDs use only 1/10 the energy of mini-lights! And try not to get caught up in that “my house has more lights than yours” trap. Simple designs can be beautiful. But most importantly, as with all outside lights, don’t forget to turn them off before you go to bed.